What is phak tiu som, or instead of cherry blossom III? Yesterday Ketsanee ate a green dish and I curiously asked what the chief vegetable was. “Phak tiu som” she answered. She showed me a small bush near the gardener’s house I had not noticed before. “It does not grow in Chiang Mai, my mom had to bring it from Esan” she claimed. I checked a Thai book on Thai vegetables, but ‘tiu som’ was not included. I checked Tem Smitinand’s book ‘Thai Plant Names’, and he referred to Cratoxylum formosum (Hypericaceae). Luckily this plant already grows at Dokmai Garden, and I could quickly see Ketsanee’s leaves did not belong to this species. Smitinand was probably not wrong, but apparently the name is applied to other species too. I checked another book, where ‘phak tiu’ referred to Cratoxylum in general. I thought it looked like Cratoxylum maingayi, another species we grow at Dokmai Garden. I walked away to pick a young shoot from our garden specimen and then I asked Den, our Karen worker, if he knew this vegetable. He did not. Then I asked Khun Nived, Dokmai Garden’s herb master. She confirmed “phak tiu!”. Now, the Thai name of this species is not included in the famous ‘Field Guide to Forest Trees in Northern Thailand’, and there is not even a picture. It states the flowers are smaller than the bright red C. cochinchinense, but if my identification is correct they are in fact larger. The distribution is from southern Burma to Borneo. According to Mabberley’s Plant Book there are only six Cratoxylum species in the world, all from the Indomalayan region. We need an English name, so I consulted the botanary with translations of 21000 botanical names, but Cratoxylum was not included. I consulted Zander’s Handwörterbuch der Pflanzennamen with 20 000 species, but the genus was not included there either. Obviously we need to tell the world about this beautiful tree and its edible sour leaves. We hereby propose the English name ‘Sourleaf tree’ for the genus Cratoxylum. 1. Pick a handful young acid shoots of sourleaf. 2. Boil the leaves in water for ten minutes. 3. Remove the water like when you cook pasta, and then rinse with cold water to cool down the leaves. 4. Press out remaining water with your hands. 5. Cut into small pieces with a knife. 6. Transfer the leaves to a mortar and add 1 teaspoon of fish sauce, a pinch of salt, 2 spring onions, chili powder, 2-5 garlic cloves (depending on size) and 1 teaspoon of anchovy sauce. 7. Pound, mix and serve with sticky rice and any fresh vegetable you like. 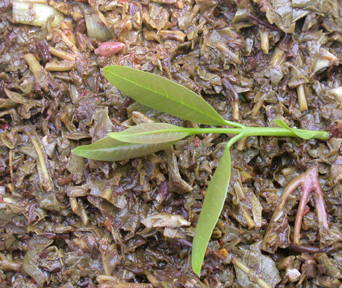 A fresh shoot of C. maingayi from a specimen grown in the shade, placed on top of the cooked leaves. Young shoots in the sun are red. 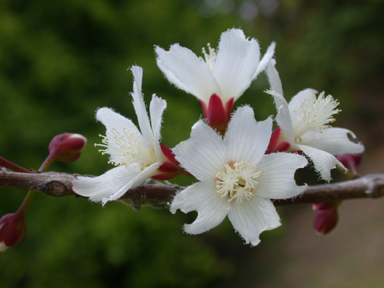 The cherry-like blossom which emerge in early March are quite attractive, which is why it is sad when somebody buys a piece of land and dismiss the original vegetation as weeds, and replace them with another Plumeria heaven. A characteristic of many Cratoxylum spp. is the hairy petal edges. The dents of the petals are not characteristic, they are due to Dokmai Garden being organic.